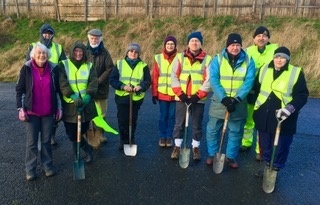 On a cold winters day in January 2018, 12 Rotarians and partners from Mirfield Rotary Club joined Roger Parkinson from the Woodland Trust to plant 150 native deciduous trees. It is recommended bare rooted trees should be planted in the cold dormant part of the year - the volunteers can testify the trees should have felt to have been planted in perfect conditions. We had brief spells of sunshine, rain, wind, sleet and the odd flurry of snow. However a job well done and we look forward to Roger attending the club in April when we will hear more of the work done by the Woodland trust.